Should Beheadings Be Raised to Capital Murder? As you may have seen, the US has a recent beheading. Oklahoma of all places. There may be a call to raise beheading murders to capital murder. I say, Why not consider it. I’ve read pertinent portions of the Koran that speak to beheadings of Christians. The Koran’s justification is that Christians are considered polytheists and therefore the equivalent of heathens and atheists and may be killed if they do not convert to the Muslim faith after being given a chance to reform. From reading a paper from the Catholic Church, the Muslim faith is powerful in the sense that Muslims believe no intercessor is necessary to communicate directly with or to God. I am given to understand that there may be a similar concept of direct communication with God that exists in at least one Protestant faith. In fact, the Muslim concept of four or so Muslims wandering the streets looking to enforce religious standards as they find them is similar to Karl Marx’ notion of a core of committed Communists whose faithful indoctrination to chiliastic Marxist utopian principles guide their on-the-spot enforcement of party rules thereby purporting to eliminate the need for sheriffs, juries, lawyers, judges and executioners. In a way, that sounds similar to the current administrative state. Only in the instance of Muslims and Communists, they could have a senior cleric or party officer bless the actions instead of an administrative law judge. We also see elements of civil disobedience, I suppose a form of sporadic refusal to submit to civil authority, in the various Communist liberation movements. Brezhnev referenced the existence of various national liberation movements in 1973. And the animal liberation movement got a push with the publication a book of the same name in 1975. Animal liberation papers on civil disobedience followed. The various reprints of Blackstone’s on common law, adopted by Texas via Virginia, consistently make clear the prohibition of the combination of the office and duties of the Sheriff with the office and duties of the Judge as obvious conflicts. And authentic due process can only come from honoring the priority of individual rights to confront the accuser (who may be the Sheriff himself), put the accuser to the burden of proof in front of an impartial magistrate and have the benefit of a jury of fellow citizens in order to insulate citizens from overreach by both the Sheriff and the King’s orders. Proceedings such as that described by the Koran provide for a process, but not authentic due process, and so that is why I say the Koran does not submit to civil authority. I am not saying that all practitioners of the Muslim faith do not submit to civil authority. But, I am saying that anyone who acts upon the literal meaning of ancient text, regardless of religious affiliation, that refuses to recognize the God-given fundamental rights of other individuals will lead to serious trouble. So what would a capital punishment statute look like. I don’t know all the particulars at this early point, but one would think from the defense angle that an individual’s fundamental religious freedom does not extend to private executions. In the instant Oklahoma case, it appears, so the allegations seem at this early point, not commenting on guilt or innocence, rather the mechanics of the alleged murder, that the act of beheading did not result in the death, instead occurred after the fatal stabbing. If a capital murder statute had to allege the cause of death as beheading, then murder first by some other means and some sort of body mutilation afterwards might constitute a defense to capital murder by beheading. So, I would think that one might want to take that into account somehow, if possible, so that the death penalty cannot be avoided that way. Another aspect is whether the means (manual or mechanical) of beheading should be omitted from such a statute. If so, then some guillotine deaths might also fall under such a statute which would not be an automatically bad thing. But remember that in the past, some hangings accidentally resulted in separated heads. Forever, I’ve heard the Catholic Church criticized for overreach during the Spanish Inquisition. After a little research I discovered that the Spanish Inquisition came at the end of a 450 year long struggle by the Spanish to rout the Moors (Muslims) from Spain. As in the beginning of any struggle, there is a lag time between the attack and the response. And after the defense is built up, there is lag time at the end of any long struggle, where the remaining vestiges of the forces used to oust the enemy continue to exist. Those remaining forces then seek purpose for its continued existence. So it must have been with the Spanish. In fact, the end of the ejection of the Moors from Spain was marked by Columbus’ voyage in 1492 to the Americas. I think we should consider responding more quickly than any 450 years to recognize and respond to extralegal proceedings occurring inside our borders but that operate outside the limitations of the civil law and of the limitations imposed by the US Constitution. 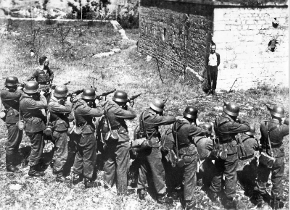 Wyoming says a firing squad is the most practical way to carry out capital punishment.